The NANDA nursing diagnosis Risk for Infection is defined as at increased risk for being invaded by pathogenic organisms. 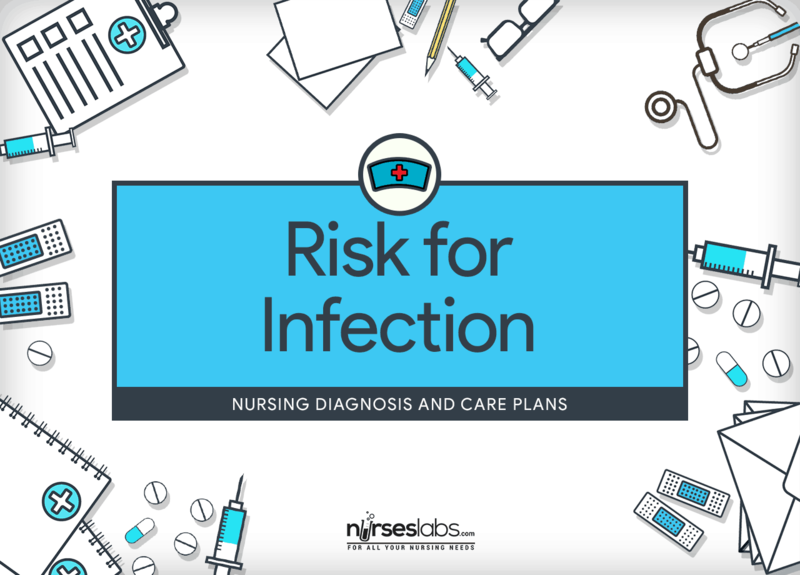 Use this nursing diagnosis guide to create your Risk for Infection Care Plan. Infections occur when the natural defense mechanisms of an individual are inadequate to protect them. Organisms such as bacterium, virus, fungus, and other parasites invade susceptible hosts through inevitable injuries and exposures. People have dedicated cells or tissues that deal with the threat of infection. These are known as the immune system. The human immune system is crucial for survival in a world full of potentially deadly and harmful microbes, and serious impairment of this system can predispose to severe, even life-threatening, infections. Organs and tissues involved in the immune system include the thymus, bone marrow, lymph nodes, spleen, appendix, tonsils, and Peyer’s patches (in the small intestine). If the patient’s immune system cannot battle the invading microorganism sufficiently, an infection occurs. Breaks in the integument, mucous membranes, soft tissues, or even organs such as the kidneys and lungs can be sites for infections after trauma, invasive procedures, or invasion of pathogens through the bloodstream or lymphatic system. And a common means for infectious diseases to spread is through the direct transfer of bacteria, viruses or other germs from one person to another. This can transpire via contact, airborne, sexual contact, or sharing of IV drug paraphernalia. Also, having inadequate resources, lack of knowledge, and being malnourished place an individual at high risk of developing an infection. Infections prolong healing and can result in death if treated inappropriately. Antimicrobials are widely used to treat infections when susceptibility is present. However, for some organisms such as the human immunodeficiency virus (HIV), no antimicrobial is effective. Another common medical intervention is called the immunization. This is also universally used for those who are at high risk for infection. 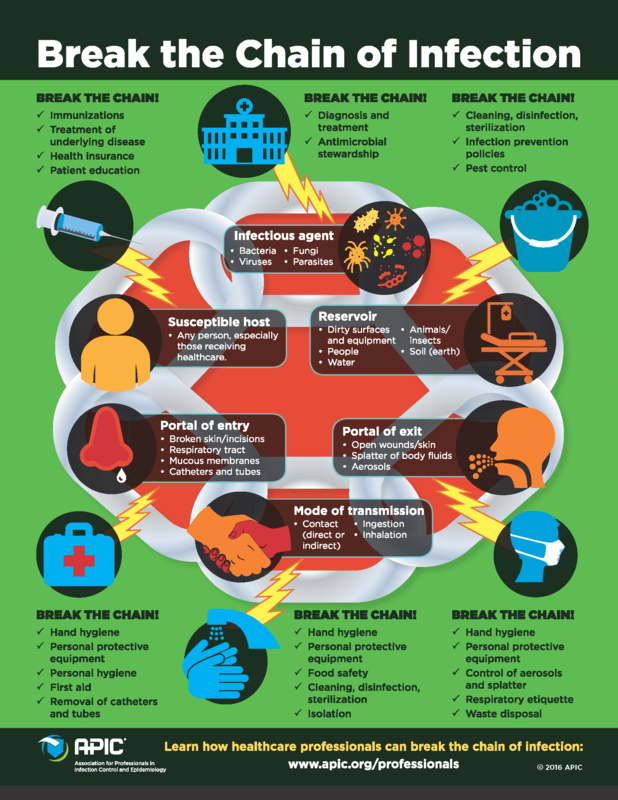 Handwashing is the best way to break the chain of infection. Specific nursing interventions will depend on the nature and severity of the risk. Patients should be informed and well-educated by nurses on how to recognize the signs of infection and how to reduce their risk. Inadequate primary defenses (e.g., broken skin integrity, tissue damage). Insufficient knowledge to avoid exposure to pathogens. Compromised host defenses (e.g., cancer, immunosuppression, AIDS, diabetes mellitus). Compromised circulation (e.g., obesity, lymphedema, peripheral vascular disease). A site for organism invasion (e.g., surgery, dialysis, invasive lines, intubation, enteral feedings). Increased vulnerability of infant (e.g., HIV-positive mother, lack of normal flora, lack of maternal antibodies). Patient remains free of infection, as evidenced by normal vital signs and absence of signs and symptoms of infection. Early recognition of infection to allow for prompt treatment. Patient will demonstrate meticulous hand washing technique. For the complete list, visit Risk for Infection. Assess for the presence, existence of, and history of risk factors (mentioned above). These represent a break in the body’s normal first line of defense. Very low WBC count may indicate a severe risk for infection. In older patients, infection may be present without an increased WBC count. Assess and monitor nutritional status, weight, history of weight loss, and serum albumin. Patients with poor nutritional status may be anergic or unable to muster a cellular immune response to pathogens making them susceptible to infection. For pregnant clients, assess the intactness of amniotic membranes. Prolonged rupture of amniotic membranes before delivery puts the mother and neonate at increased risk for infection. Investigate the use of medications or treatment modalities that may cause immunosuppression. Antineoplastic agents, corticosteroids, and so on, can reduce immunity. Assess immunization status and history. People with incomplete immunizations may not have sufficient acquired active immunity. Redness, swelling, increased pain, purulent discharge from incisions, injury, and exit sites of tubes (IV tubings), drains, or catheters. These are the classic signs of infection. Any suspicious drainage should be cultured; antibiotic therapy is determined by pathogens identified. Elevated temperature. Temperature of up to 38º C (100.4º F) 48 hours post-op is usually related to surgical stress after 48 hours, temperature of greater than 37.7º (99.8º F) may indicate infection; very high temperature accompanied by sweating and chills may indicate septicemia. Color of respiratory secretions. Yellow or yellow-green sputum is indicative of respiratory infection. Appearance of urine. Cloudy, turbid, foul-smelling urine with visible sediment is indicative of urinary tract or bladder infection. Maintain or teach asepsis for dressing changes and wound care, peripheral IV and central venous management, and catheter care and handling. Aseptic technique decreases the changes of transmitting or spreading pathogens to the patient. Interrupting the transmission of infection along the chain of infection is an effective way to prevent infection. Before putting on gloves and after taking them off. Before and after touching a patient, before handling an invasive device (foley catheter, IV catheter, and so on) regardless of whether or not gloves are used. After contact with body fluids or excretions, mucous membranes, nonintact skin, or wound dressings. If moving from contaminated body site to another site during the care of the same individual. After contact with inanimate surfaces and objects in the immediate vicinity of the patient. After removing sterile or nonsterile gloves. Before handling medications or preparing food. Friction and running water effectively remove microorganisms from hands. Washing between procedures reduces the risk of transmitting pathogens from one area of the body to another. Wash hands with antiseptic soap and water for at least 15 seconds followed by alcohol-based hand rub. If hands were not in contact with anyone or anything in the room, use an alcohol-based hand rub and rub until dry. Plain soap is good at reducing bacterial counts but antimicrobial soap is better, and alcohol-based hand rubs are the best. Encourage intake of protein-rich and calorie-rich foods. Helps support the immune system responsiveness. Encourage fluid intake of 2,000 to 3,000 mL of water per day, unless contraindicated. Fluids promote diluted urine and frequent emptying of bladder – reducing the stasis of urine, in turn, reduces risk for bladder infection or urinary tract infection. Encourage coughing and deep breathing exercises; frequent position changes. Helps reduce stasis of secretions in the lungs and the bronchial tree. When stasis occurs, pathogens can cause upper respiratory tract infections and pneumonia. Recommend the use of soft-bristled toothbrushes and stool softeners to protect mucous membranes. These may compromise the integrity of the mucous membranes and provide a port of entry for pathogens. Limit visitors. Restricting visitation reduces the transmission of pathogens. Cover mouth and nose during coughing or sneezing. Use tissues to contain respiratory secretions with an immediate disposal to a no-touch receptacle; wash hands with soap and water afterward. Educating visitors on the importance of preventing droplet transmission from themselves to others can help reduce the risk of infection. Place the patient in protective isolation if the patient is at very high risk. Protective isolation is set when WBC counts indicate neutropenia (less than 500 mm3). Initiate specific precautions for suspected agents; follow infection prevention according to institution or CDC protocol. Gloves Wear gloves when providing direct care; wash hands with soap and water after properly disposing of gloves. Masks Use masks, goggles, or face shields to protect the mucous membrane of your eyes, mouth, and nose during procedures and direct-care activities (e.g., suctioning oral secretions) that may generate splashes or sprays of blood, body fluids, secretions, and excretions. Gowns Wear a gown for direct contact with uncontained secretions or excretions. Remove gown and perform hand hygiene before leaving the patient’s room or cubicle. Do not reuse gowns even with the same individual. Teach the patient and/or SO to wash hands often, especially after toileting, before meals, and before and after administering self-care. Patients and SO can spread infection from one part of the body to another – handwashing reduces these risks. Teach the patient the importance of avoiding contact with individuals who have infections or colds. Other people can spread infections or colds to a susceptible patient through direct contact, contaminated objects, or through air currents. Demonstrate and allow return demonstration of all high-risk procedures that the patient and/or SO will do after discharge, such as dressing changes, peripheral or central IV site care, and so on. Patient and SO need opportunities to master new skills to reduce risk for infection. Teach the patient, family, and caregivers, the purpose and proper technique for maintaining isolation Knowledge about isolation can help patients and family members cooperate with specific precautions. If infection occurs, teach the patient to take antibiotics as prescribed. Instruct patient to take the full course of antibiotics even if symptoms improve or disappear. Antibiotics work best when a constant blood level is maintained which is done when medications are taken as prescribed. Not completing the prescribed antibiotic regimen can lead to drug resistance in the pathogen and reactivation of symptoms.